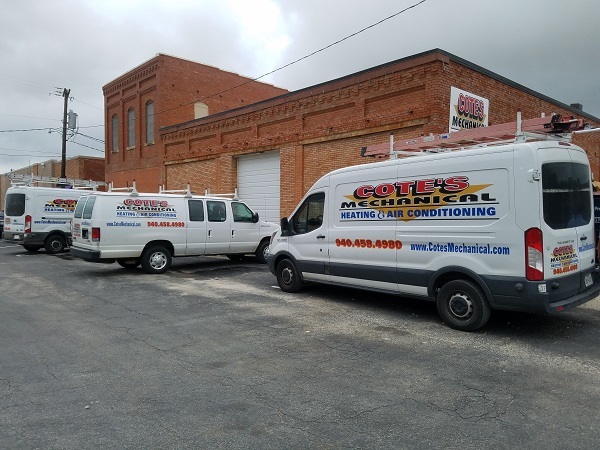 Cote’s Mechanical is a company of HVAC professionals led by husband and wife team Cote and Kristi Wyatt. They founded the company in 2001 and it quickly grew into a well-established company with over 40 employees. Now, Cote’s Mechanical is a trusted name for air conditioning and heating services in and around Sanger, TX. We are dedicated to installing and repairing your A/C or heater quickly and correctly. With 24-hour emergency service, you never have to go without air conditioning for long on unbearably hot days. One of our greatest passions is to improve the energy efficiency of your home. This allows you to save money and also reduces your home’s impact on the environment. We only install equipment that is highly energy efficient and that will last for a long time. We also do attic insulation and ventilation work. These services further improve the efficiency and air quality of your home and are important elements of making sure that your A/C and heater work as well as possible. Cote’s Mechanical is a Trane Comfort Specialist. To receive this certification, our company must meet strict standards in all aspects of our training, repairs, installations, and customer service. We are also accredited by the ACCA, which means that we have met the highest quality standards in our work. Our superior work has been recognized by past awards and accolades. These include an Angie’s List Super Service Award and an A+ rating from the Better Business Bureau. These accolades serve to highlight just how dedicated we are to providing you with the highest-quality service.